Eni S.p.A., an Italian multinational oil and gas company headquartered in Rome, and the Italian Biogas Consortium (CIB) have signed an agreement to promote the production of advanced biomethane from animal waste, agro-industrial byproducts and dedicated winter crops for use in the transport sector. The agreement also involves new opportunities for Consortium member companies by launching business initiatives which will be developed in partnership. 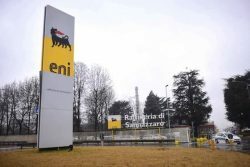 Eni plans to deliver the renewable natural gas (RNG or biomethane) to its service stations through commercial and industrial collaboration with the Consortium’s member companies. A taskforce will be established and will meet periodically to assess and define the most efficient and appropriate opportunities for collaboration. The agreement is a central component in Eni’s efforts to promote the principles of the circular economy in energy production. It was signed at Eni’s Sannazzaro de’ Burgondi Refinery in the Province of Pavia by Giuseppe Ricci, Eni Chief Refining & Marketing Officer, and Piero Gattoni, President of the Italian Biogas Association, with the Italian Minister of Agricultural, Food, Forestry and Tourism Policies Gian Marco Centinaio Gian Marco Centinaio. Part of the agreement is in-depth examination with the members of commercial and industrial initiatives through a system that starts from biogas, which is produced currently and already used to generate electricity and thermal energy, being refined so that it can be used as a fuel for road transport, in the form of compressed gas or liquefied natural gas. Eni is targeting the collection of around 200 million cubic metres of biomethane, which can be produced by CIB members, through the consolidation of methane generated and produced in agricultural and livestock farming processes. The benefits will be lower atmospheric emissions and a more competitive primary sector. Biomethane is a useful energy resource which is able to contribute to a reduction in greenhouse gas emissions and other contaminants, as well as being a factor in the economic and industrial development of land through effective use of the supply chains of the agricultural and agri-food sectors. Agro-energy sources represent an essential supplement to the income of agricultural businesses. Focusing on advanced biofuel production in this way is an important sign of attention towards a sector that has invested more than 4 billion euros and created 12,000 jobs in the last four years. This agreement promotes the refinement of biomethane biogas in complete collaboration and fully integrated with the many agricultural and livestock companies in the Consortium. For Eni, it represents another step forward in the production of advanced biofuels and aligns with the transformation of the Venice and Gela bio-refineries. “The biogas and biomethane sector is a fundamental reality in Italian agriculture, which requires investment focusing on technology and research. The agreement between the Italian Biogas Consortium and Eni can be seen as a tangible effort towards innovation and to protect the environment. A major challenge heading towards the future and cleaner, greener energy can start from agriculture, a primary sector of our economy,” stated senator Gian Marco Centinaio, Italian Minister of Agricultural, Food, Forestry and Tourism Policies.